Simple. Healthy. Fitness. is back with Nicky Hollender to bring you five intense, ab-defining moves to flatten your tummy and get that slammin’ end-of-summer bod. Studies have shown that surprising your body with short and intense workouts helps to improve your strength and boost your mood. 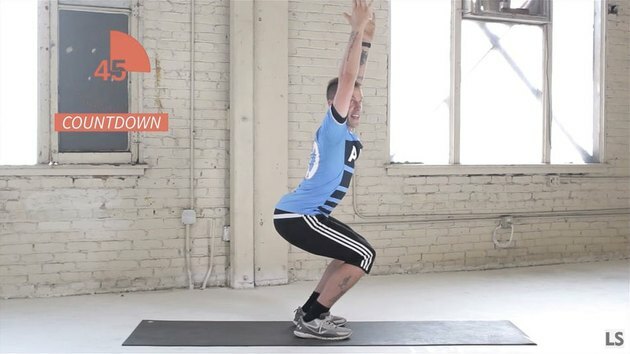 Below are five videos, each dedicated to an energizing one-minute exercise. If you prefer to shred through your workout, we’ve combined all the moves into one five-minute HIIT workout that will get you solid to the core. Summer’s the season to get those abs in shape. Try these simple moves to get you feeling and looking amazing. With this move, you’ll be utilizing the burn in your legs to get that fat-blasting contraction in your abs. Try to keep your back straight and reach out through your fingertips to get your endorphins firing. You get the picture: You’ll be bringing your chest and your knees together like a jackknife, contracting your core. Lift your chest first, and keep your abs engaged throughout the entire exercise to tone your muscles. Try to keep your legs elevated. If you need a break from the burn you can tap your legs down. This rewarding exercise allows you to use the momentum from your arms to help you tighten your abs and get the most out of your minute. Use the force in your heels to stabilize you and maintain control as you return to your starting position. Speed it up or take it slow to get the workout you want! This easy move is a take on the plank, only you’ll be extending your forearms out as far as you can while maintaining control. Then all you have to do is hold. Push your toes into the ground and make sure to straighten your back and tuck your belly button so you can shred those abs. If you find yourself a little overextended you can rest your knees on the ground. This twist targets your transverse abs — the muscles that wrap around your core. Make sure that you raise your upper body before your leg, and keep your leg as straight as possible in order to stretch your hamstring. Tighten your core as you do the twist. Try these easy exercises from Simple. Healthy. Fitness. and Nicky Hollender. Treat your body to short bursts of high-intensity exercises to improve your overall strength and mental wellness. Find our five-minute compilation video below! Will you be adding any of these exercises to your workout routine? Which did you think was the most challenging? What's your favorite Nicky Hollender motivational quote?